When David came in to see Dr. Tehrany, he was hardly able to move without pain in his knee. 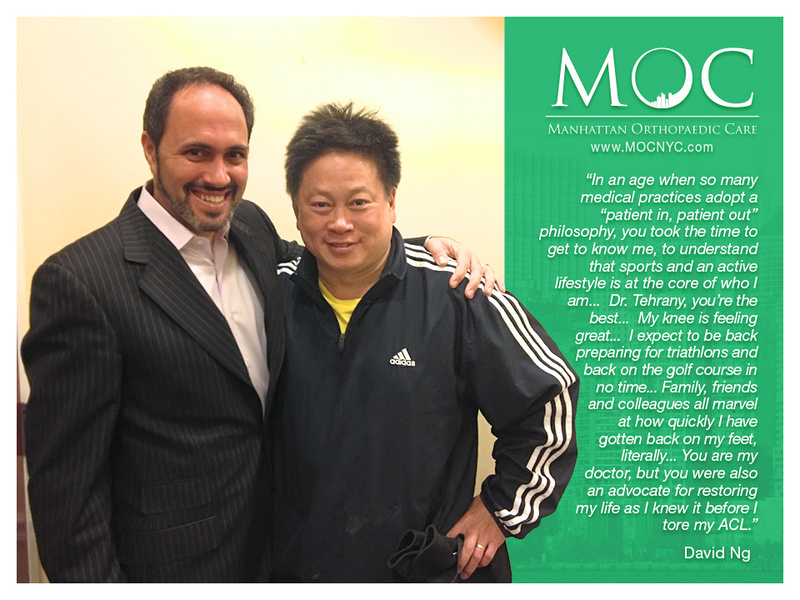 Dr. Tehrany, a top knee surgeon in NYC, diagnosed David with an ACL injury, which required an ACL knee surgery. As we are committed to providing the perfect orthopedic care for our patients, we did our best to enable David to move lightly without any pain or struggle. We are moved by his kind words that express his happiness and satisfaction with the work of the Manhattan Orthopedic Care team. “Dr. Tehrany, you’re the best. My knee is feeling great and the recovery is progressing extremely well. It’s hard to believe that my ACL surgery was only a month ago. At the rate I’m going, I expect to be back preparing for triathlons and back on the golf course in no time at all. Family, friends and colleagues all marvel at how quickly I have gotten back on my feet, literally, after my ACL injury.” David said in his testimonial.